Welcome back from a beautiful sunny and warm Family Day, for those of you in Ontario, at least. We had a busy weekend celebrating our childrens’ 25th birthday with lots of family to help us. Then we headed off to a Senator’s hockey game, sadly they lost but like true fans, we still enjoyed the game. I just have a quick post today about kitchen valances. I was asked by Wayfair a few weeks ago to give their consumers a bit of advice on how to choose kitchen valances for a contemporary kitchen. The link is live today, so if you’re in the market for some kitchen valances to soften your kitchen, you can read about all the different styles and how to choose the best one for your home. Click on their logo below to be directed to the article. And here’s an adorable little video showing the different styles of valances. So now that Spring has finally sprung here in Ontario, it’s all about updating and freshening up. This past week I was helping a client do just that by giving her entry a new feel. Some fresh graphic wallpaper is the key piece and it will help make a grand statement to all who arrive. 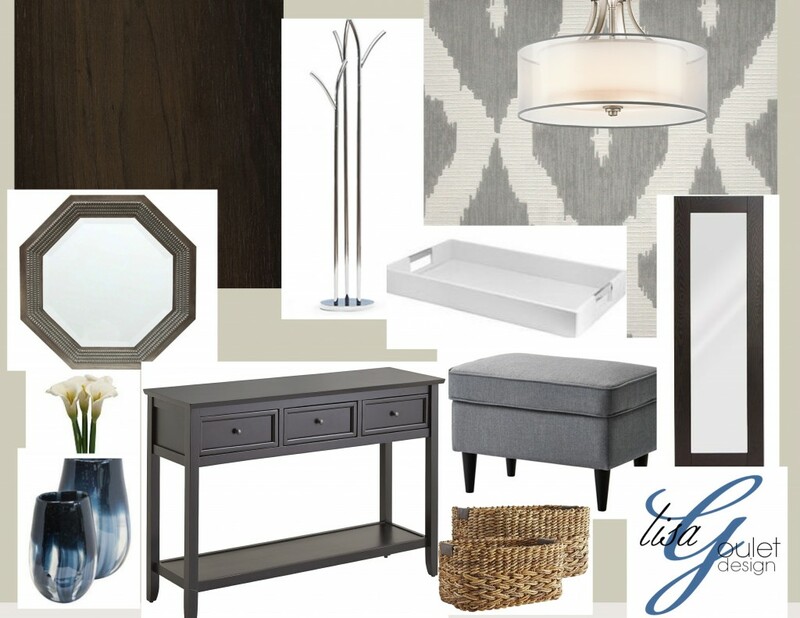 The new dark hardwood floor and dark mirror will ground the space and complement the soft grey walls. A hint of silvery metal in the pendant, tray, coat rack and hardware will give a little sparkle. Texture comes in from the paper, baskets, and mens-wear grey inspired fabric on the ottoman. A classic console and an octagon shaped mirror make a great match and the blue vase and flowers are a little finishing touch to pull in the blues in an adjoining room. I can’t wait to see it completed!